The Mozambique LNG (Liquid Natural Gas) Project will facilitate the export of an enormous quantity of gas located in the gas fields of Area 1 of the Rovuma basin off the coast of northern Mozambique. In the process it will have serious adverse impacts on ecosystems and wildlife, will lead to the forced displacement of thousands of people, and will release millions of tonnes of greenhouse gases including methane every year. The development of new fossil fuel projects is completely at odds with the core aim of the Paris Climate Agreement to limit global temperature rises to significantly below 2 degrees Celcius, aiming for 1.5 degrees. The Mozambique LNG Project will involve the extraction, liquefaction and transportation of gas from the Area 1 gas fields offshore from northern Mozambique. Gas will be extracted from 20 offshore wells and transported via a 40 km pipeline to an onshore liquid natural gas (LNG) facility covering an area of 17,000 acres. Here the gas will be liquified and stored in two large tanks. A pipeline will transports the LNG to tankers for export to India and other countries. The US-headquartered Anadarko Petroleum Corporation is the largest shareholder in the Mozambique LNG project, with a 26.5% shareholding. The LNG facility is expected to produce 12.88 million tonnes per year of LNG in its initial phase, which can be expanded to 50 million tonnes. The project is estimated to cost USD 20 billion, with a final investment decision expected in the first half of 2019. Anadarko signed the exploration contract with the government of Mozambique in 2007. 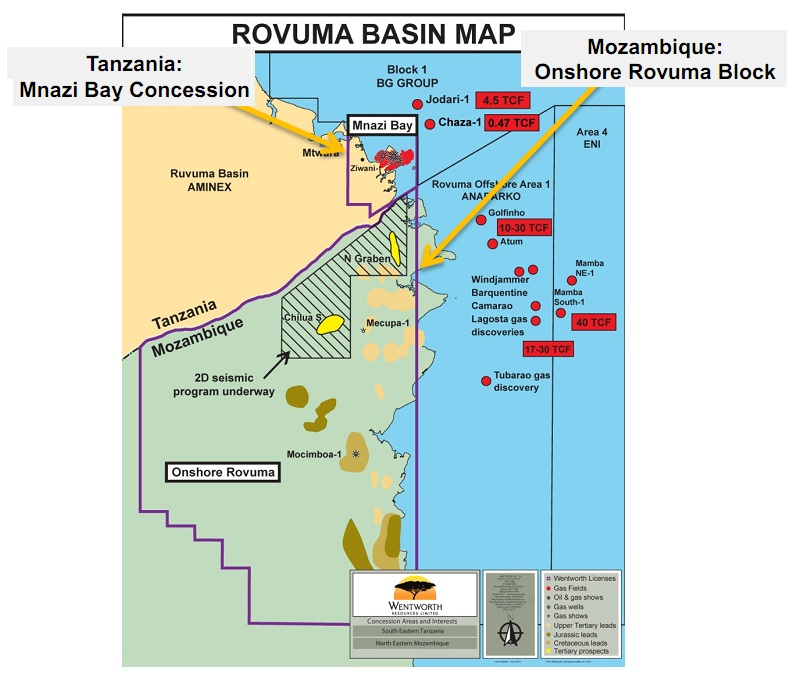 Following several years of exploration, in 2012 a major natural gas discovery was made in Area 1 of the Rovuma basin offshore North Mozambique. In the same year Anadarko and Eni reached an Agreement for the coordinated development of Area 1 and Area 4. In 2015 Anadarko announced the selection of a consortium consisting of CB&I, Chiyoda Corporation and Saipem (CCS JV) for the initial development of the onshore LNG park. The resettlement plan for the project area was formally approved in 2016 and the development plan for Golfinho-Atum was approved in 2018. Several purchase agreements for the gas extracted from Area 1 have already been signed. In 2017, the Thai state-owned PTT group, formerly known as the Petroleum Authority of Thailand, signed an agreement to buy 2.6 million tonnes of gas per year. In 2018, Électricité de France signed an agreement with Mozmabique LNG, as did Tokyo Gas Co and Centrica LNG Co, a co-purchase also for 2.6 million tonnes of gas a year. Banks and other financial institutions should steer clear of funding this project as it has serious negative environmental and social impacts. Financing this large infrastructure for a LNG facility will also mean a disincentive to construct and invest in renewable energies. Forced displacments Anadarko admits that "once the construction phase of the project commences, it will also mark the beginning of industrial scale land clearance, excavations and earth moving activities" and "that the nature and scale of construction activities will not allow for communities to remain and continue their subsistence livelihoods in close proximity to the LNG processing plant." The project would result in forced displacements for thousands of people, who are particularly vulnerable and have to this day received no substantial information on what justifies their resettlement and what will happen to them in the short, medium or long term. The project has failed to carry out mandatory community consultations and to observe due process in pre-existing land rights expropriations and community prior and fair compensations, in breach of laws according to the Centro Terra Viva Mozambique. Impacts of project research The seismic research related to this project has already affected local communities. Several harpoon fishermen suffered hearing injuries from the seismic guns while fishing. Many fishermen were forced to suspend their fishing activities for extended periods of time. This negatively impacted the communities’ means of subsistence and, according to the local fishermen, they were not given any compensation. Anadarko’s environmental impact assessment spells out a list of wide-ranging consequences: clearance of mangroves, introduction of invasive species from ballast shipping water, greenhouse gas and toxic sulfur dioxide emissions, soil erosion, and ecological losses to wetlands and the birds, reptiles and amphibians that inhabit them. Coastal seabeds would be dredged to create shipping lanes and a corridor for the 40 km-long pipeline, which scientists say could damage coral reef networks. Impacts on climate The environmental impact assessment estimates the project's direct emissions at 12.9 million tons of CO2 per year from 2022 onwards. The proposed LNG facility will release a large amount of greenhouse gas emissions, especially methane. The assessment underestimates the impact of methane that will be released during the extraction, processing and transportation of the natural gas off the coast of Mozambique. Methane is 87 times as potent as CO2 over 20 years according to a recent IPCC report. When this is taken in consideration direct emissions are closer to 44.9 million tons. Impacts on biodiversity The project puts unique ecosystems and endangered species at great risk of complete destruction. The 3,600 ha project would be located on the northern coast of Mozambique, where mangrove forests, coral reefs and seagrass beds are important for biodiversity but remain very vulnerable habitats. The project environmental impact statement also indicates that the nearshore and offshore areas include a number of species, such as sei whales, Indian yellow nosed albatross, leatherback, and hawksbill turtles, that are considered imperiled by the International Union for Conservation of Nature. The project also threatens the Quirimbas National Park, located in the same province (Cabo Delgado) as the project area. Quirimbas was recently designated a UNESCO Biosphere Reserve, and consists of 11 islands, a combination of marine parks and a freshwater system including the Montepuez river and Lake Bilibiza, a bird sanctuary. The islands are home to thousands of species of flora, hundreds of bird species, a variety of reptiles, and nearly fifty species of land mammals including elephants, lions, buffalos, and leopards, while their waters are habitat for eight species of marine mammals. Impacts of project research The seismic survey (ordered by Anadarko) has been criticized by environmental organisations for its damaging effects on marine animals and financial losses of local fishermen. Many issues have already been reported including as the death of large numbers of shallow-water bottom-feeding sea-grass fish, shellfish and turtles. The project is expected to cost USD 20 billion, financed on a debt-equity ratio of 75:25 with the debt portion to be funded via project finance (according to Anadarko's 2017 annual report). Anadarko is seeking USD 14-15 billion from banks and export credit agencies in debt finance, which will make this the largest project finance loan to date in the LNG sector. Sociéte Générale is the financial advisor on the project. 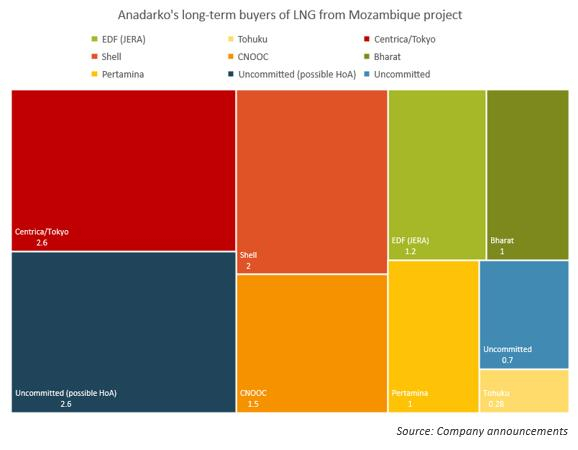 Mozambique LNG is a joint venture of seven international companies, of which Anardarko is the largest share holder with 26.5% (Anadarko 2016 project overview). These companies are listed below.